 Mouse anti Human CD283 antibody, clone TLR3.7 recognizes human and canine TLR3, otherwise known as CD283. TLR3 is a member of the Toll-like receptor (TLR) family and functions as a receptor for double-stranded (ds) RNA. TLRs are expressed on the cell surface and the endocytic compartment and recognize pathogen-associated molecular patterns (PAMPs) that are expressed on infectious agents.They also initiate cell signalling to induce production of cytokines necessary for the innate immunity and subsequent adaptive immunity. Cell surface expression of TLR3 has been reported on MRC-5 fibroblasts (Matsumoto et al.2002). Mouse anti Human CD283 antibody, clone TLR3.7 has been shown to suppress poly (I) : poly C mediated IFN beta production by these cells. Ba/F3 cells transfected with human TLR3 (CD283). Matsumoto, M. et al. (2002) Establishment of a monoclonal antibody against human Toll-like receptor 3 that blocks double-stranded RNA-mediated signaling. Biochem Biophys Res Commun. 293 (5): 1364-9. Tamassia, N. et al. (2008) Activation of an immunoregulatory and antiviral gene expression program in poly(I:C)-transfected human neutrophils. Mendoza, C. et al (2012) Toll-like receptor 3 activation affects serotonin transporter activity and expression in human enterocyte-like Caco-2 cells. Cell Physiol Biochem. 30: 187-98. Surendran, N. et al. (2018) TLR agonist combinations that stimulate Th type I polarizing responses from human neonates. Innate Immun. 24 (4): 240-251.